Avoidance Area: Ships working in the area are requested to observe an avoidance area of at least 4NM radius (7.5km) from the stated anchor position. The KEO mooring has a large scope, and the anchor position changes with each deployment. 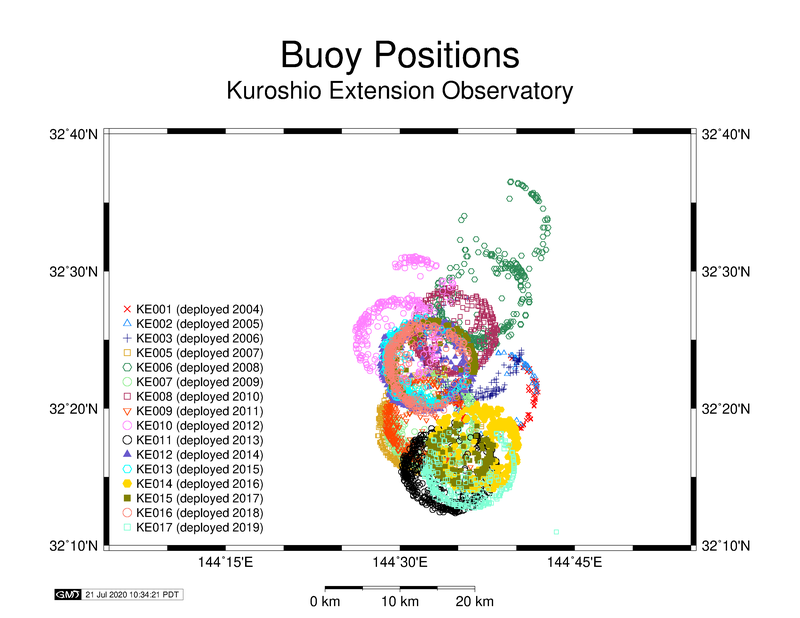 When using KEO data in scientific analyses, it may be appropriate to consider the actual position of the buoy rather than its nominal position. The nominal depths should NOT be used for sensor depths. Instead, the time-varying subsurface pressure of the sensor should be used to determine the measurement depth. Refer to the mooring diagrams (links) in the table below for exact specifications of each deployment. The positions noted in the table indicate the center of the watch circle. 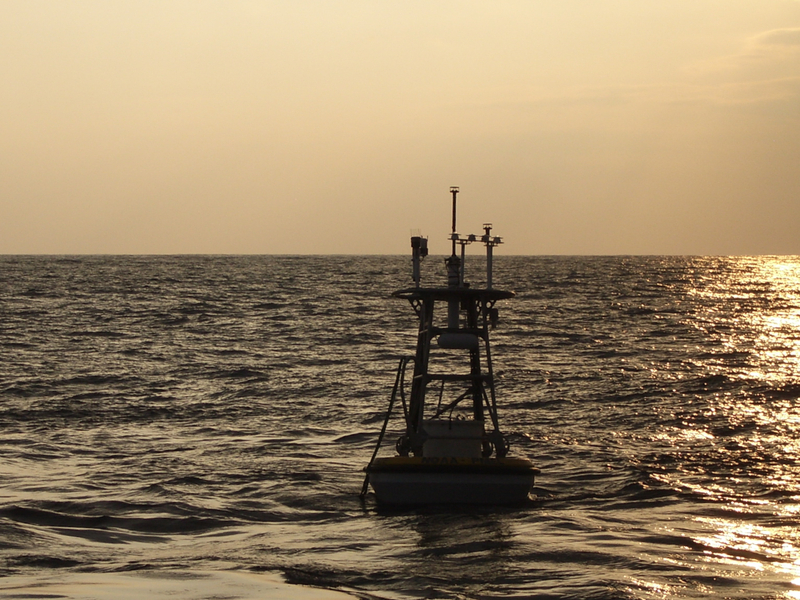 For KEO, the buoy position can be more than 5km from the listed position. The KE-003 mooring broke free from its anchor on April 16, 2007, and was adrift. The break occurred at the bridle, so no subsurface instruments were recovered. High-resolution data are only available from the recovered surface and meteorological instruments. Data delivered through the Mooring Data page are truncated at the time when the buoy moved outside its watch circle, but data from the drifting period are still available. Click here for daily averaged data, and click here for high resolution data from the drifting period. 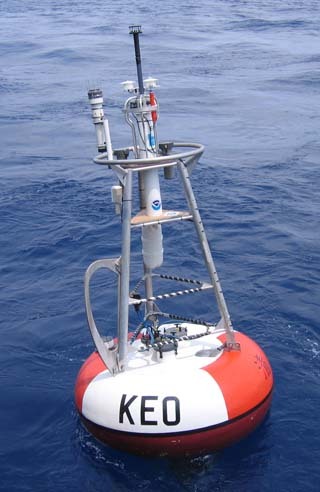 The KE-004 designation was given to a JAMSTEC mooring deployed near the KEO site in 2007. The numbered designations for the OCS moorings go from KE-003 (2006) to KE-005 (2007). The KE-010 mooring broke free of its anchor on June 7, 2013 and was recovered June 28, 2013, circulating in an eddy northwest of the nominal anchor location. The KE-015 mooring broke free of its anchor on October 19, 2017. It drifted in the recirculation gyre for two months, before being recovered on December 21, 2017 aboard the JAMSTEC S/V Yokosuka. The following storms have passed over or near the KEO mooring, and data from those periods are available. If the primary sensor failed due to storm damage, data from the secondary, or in some cases tertiary, sensor have been included in the data set. These substitutions are indicated in the quality flags.